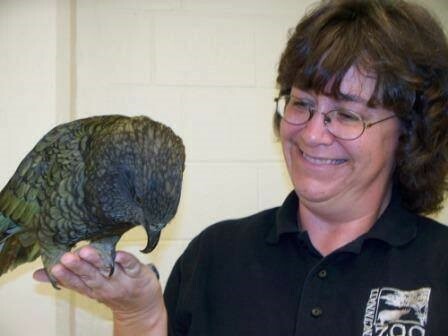 This month’s featured CPBT-KA (Certified Professional Bird Trainer - Knowledge Assessed) is Jackie Bray who is currently the Associate Director, RAPTOR Inc. in Mildford, Ohio. Her favorite species of birds to work with are kea and all raptors. Jackie said she was inspired to take the test because "I consider myself a life-long student and I love a challenge, so when I heard about the certification opportunity I wanted to prove to myself that I could pass the test during the first year it was offered. I also wanted to broaden my understanding of best practices from a local to a global perspective." "My certification helped me secure my current position. The knowledge I gained through the certification process has also shaped my attitudes and expectations regarding animal welfare and the use of live animal ambassadors in educational programs. Lastly, it helps to motivate me to participate in professional development opportunities." Jackie's advice for people thinking about getting certified? "There is a lot to gain by going through the certification process. Be familiar with the resources listed in the recommended readings list and pay close attention to terminology. Also, I highly recommend completing Dr. Friedman’s LLA class." Looking for CEUs ... Present at a workshop! As a Presenter you can earn 1.5 CEUs per hour of presentation/lecture, when the learning event meets the subject matter and scientific qualifications outlined in the IATCB CEU Policy under eligibility. Animal training classes regularly offered to the general public as part of a Certificant’s animal training and/or behavior consulting business do not qualify for CEUs. Buteo: robust hawks with long, broad, rounded wings and short broad tails. Because they are easily observed soaring in wide, lazy circles or perched in a conspicuous place, they are among the best known hawks. They hunt mainly from perches, dropping to the ground to capture their prey. Accipiter: hawks that inhabit deeply wooded areas. They have short rounded wings and long rudder-like tails which allow them to maneuver among the trees. Their recognizable flight pattern consists of several rapid flaps and then a glide. As a group accipiters are secretive and are observed less frequently than most other hawks. Falcon: streamlined fast-flying hawks. They have long, narrow, pointed wings and long narrow tails. They feed primarily on other birds and usually capture their prey in mid-air. Birds of open areas, falcons are seldom found in woods. Recently, some have adapted to living in cities and towns, nesting on bridges and buildings, in close proximity to humans. Harris's hawks are of the genus Parabuteo, meaning "similar to a buteo." They are medium-sized, heavy-set birds with broad wings like a buteo and a narrow tail like an accipiter. The Green Aracari is the smallest Aracari in its range and is one the smallest members of the Toucan family (Ramphastidae) weighing only 125-150 g. Males and females can be distinguished by different colors on the head and neck. Males have black feathers on the top, while female's crowns are reddish-brown. They can be found in tropical rainforest in Northern South America. In the countries of Colombia, Venezuela, Guyana, and Surinam. Green Aracari roost socially throughout the year with up to 5 adults and their fledged offspring sleeping in the same hole. Unlike other toucans, Green Aracaris fly quickly, in a straight line. They are the only toucans to use their nests for sleeping outside of the breeding period. To sleep, they place their bills on their backs and raise their tails to form a roof over their backs and bills. This allows them to take up less space, an advantage when sleeping 5 or 6 to a nest or in a rotten tree trunk. 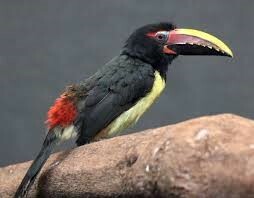 The Green Aracari has an extremely large range and does meet the thresholds for IUCN Vulnerable classification. The population size has not been quantified, but it does not appear to meet the requirements for IUCN Vulnerable criteria.